Though their workspaces feature calming tones and the soothing sounds of Enya instead of fancy framed degrees, aestheticians boast an astonishing wealth of knowledge about skin care. Sure, many don’t have medical training (though in Romania, for example, the training for aestheticians is extremely rigorous) and they can’t prescribe acne medications. But aestheticians can help you maintain skin health by performing deep-cleansing facials and exfoliation treatments, as well as extracting pore blockages. A skilled aesthetician will work with you to customize a program on how to properly care for your skin at home. Here, we talked to some of the best skin savants in the business about application tricks, key ingredients, and what they’re slathering on their respective mugs day and night. Watts prefers to wash with either a face brush (like the Clarisonic) or even a washcloth for gentle exfoliation. As for lotions and potions: "Be sure to always apply and massage in an upward motion," Watts advises. "We don’t want to drag our skin down, since our friend gravity already does that for us." Watts’ favorites? La Prairie White Caviar Illuminating Serum, "which helps with hyperpigmentation and brightens the skin instantly," and Cellular Microdermabrasion Cream, which polishes the skin evenly and smooths out fine lines instantly. "You can use it as a full-body exfoliant as well," explains Watts. Also, Philosophy's Purity Made Simple Cleanser: "It gently cleanses and removes waterproof eye makeup." Watts advises those with oily skin to look for products that contains glycolic acid, alpha hydroxy acid, and beta hydroxy acid. "Glycolic acid is an AHA used for peels that helps improve the skin's texture and overall appearance," she says. "La Prairie’s Cellular 3-Minute Peel is a convenient way to get an instant exfoliant that will make you look like you spent hours at the spa." Sporting some Sahara skin? "Use a product with emollients — lactic acid, shea butter, or lanolin," advises Watts. "They strengthen skin’s protective barrier, allowing better moisture retention." "Women (and some men) will spend thousands on a purse or shoes that will inevitably go out of style, but skin care over $100 makes us run the other way," says Watts. "Our face is the first thing people notice about us, so invest in it!" Daily, Watts does what she tells her clients to: cleanse, tone, apply a serum, use an eye cream, and moisturize AM and PM. "I always wear a moisturizer with an SPF during the day — and I never forget about my neck and décolleté," says Watts. She indulges in an anti-aging facial once a month with glycolic acid to help exfoliate and minimize hyperpigmentation, fine lines, and wrinkles. Philosophy Purity Made Simple, $20, available at Sephora; La Prairie White Caviar Illuminating Serum, $470, available at La Prairie; Clarisonic Classic Sonic Skin Cleansing System, $195, available at Clarisonic. Sunscreen should be extended all the way up and out to the hairline. "A lot of people have brown spots around the hairline on the forehead, and this can result in the improper application through the years," explains Rouleau. As for toner? "By wiping the skin with an alcohol-free toner after cleansing, you will remove tap water residue or leftover makeup" advises Rouleau. When it comes to moisturizer, do as G. Love did and stick it in the fridge. "When moisturizer is applied cold, it pushes blood away from the skin and in the process creates a vacuum effect to pull the potent serum ingredients deeper within the skin," says Rouleau. Rouleau loves The Renée Rouleau Vitamin C & E Treatment. "I can get hyperpigmentation in the summer, as heat stimulates melanin activity. Increased hormones can trigger melanin, too," explains Rouleau. Another product she loves is the ColorScience SPF 50 Mineral Powder. "I keep one in my bag so I can touch up throughout the day to ensure my skin stays protected," says Rouleau. People with oily skin should use products that are oil-free and contain sodium hyaluronate (aka hyaluronic acid) or sodium PCA, which hydrates without clogging pores. Dry skin? Look for rose hip seed oil or jojoba oil, which all help repair the skins' lipid barrier to make skin less dry over time. If you have sensitive skin, look for products that contain beta blucans, sea whip, white tea extract, and glycerin. "All of these ingredients help to keep the skin calm and make it less sensitive over time," says Rouleau. Rouleau believes a one-size-fits-all approach to skin care doesn’t work. "Look at all your skin concerns and goals for a customized routine," says Rouleau. "Having healthy, cooperative skin means adhering to a good skin care routine for your skin type and getting professional facials regularly." In the morning, Rouleau uses Purifying Face Wash from her own line in the winter, but switches to Luxe Mint Cleansing Gel in the summer. Elderberry Toner follows, then Vitamin C & E Treatment. Lastly, a layer of Daily Protection SPF 30. “Finding a sunscreen that doesn't clog the pores or feel greasy is a challenge,” says Rouleau. "I made this one to be really lightweight and greaseless, and my skin loves it." In the evening, she washes with Aloe Cleansing Milk, tones, then uses Skin Drink, a specialty serum that contains hyaluronic acid. She occasionally uses BHA Clarifying Serum to keep her skin exfoliated and smooth, and to keep clogged pores and breakouts under control, moisturizing with Sheer Moisture and Firming Eye Therapy. 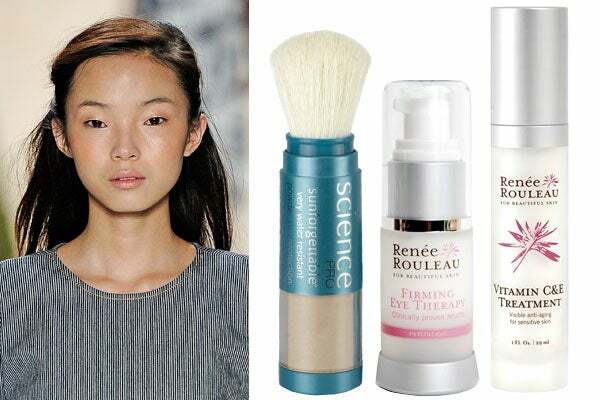 Colorscience Sunforgettable Mineral Powder Brush SPF 50, $60; available at Colorscience; Renée Rouleau Firming Eye Therapy, $41.50, available at Renée Rouleau; Vitamin C & E Treatment, $62.50, available at Renée Rouleau. Dolanescu says to start with eye cream and then neck and décolleté cream before moisturizing the face. "Allow them to penetrate for 30 seconds to a minute and end with the use of a serum and then a moisturizer on top," explains Dolanescu. "Depending on age or skin type, it can be too much to use a serum in addition to moisturizer." The last step is sunscreen. Dolanescu advises using the Orchidée Impériale Treatment, also known as "The Cure," twice a year. 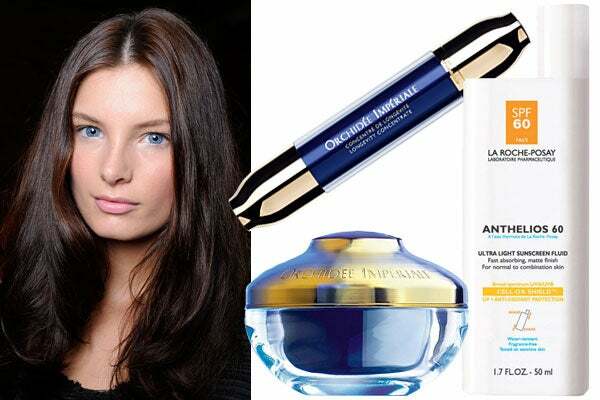 She also loves the Orchidée Impériale Cream, Longevity Concentrate, and Abeille Royale Eye Cream. Her favorite sunscreen? La Roche-Posay’s array of SPFs. Dolanescu believes in ingredients that stimulate fibroblast cells, which leads to more collagen and elastin production. "Maintaining water levels in the epidermis is very important, so ingredients like urea and hyaluronic acid are great humectants to look for. I love enzyme exfoliators because they have the ability to remove dead skin cells by melting them." Hers is simple: "We cannot stop the aging process, but if we address the skin the right way, we can age more gracefully." The skin must be prepared, stimulated, and protected, according to Dolanescu. "Sun is the enemy, so avoid it and use the products according to your age, skin type, and skin condition." Dolanescu cleanses daily in the evening twice, rinsing in between. She uses eye cream as well as a moisturizer and Orchidée Longevity Concentrate. She exfoliates once weekly and then indulges in the Orchidée Impériale Mask. "My most important step, [one] that a lot of women don’t do, would be using neck cream each evening and then putting sunscreen on every morning." Guerlain Orchidée Imperiale Concentrate, $490, available at Neiman Marcus; Orchidée Impériale Cream, $195, available at Nordstrom; La Roche-Posay Anthelios 60 Ultra Light Sunscreen Fluid, $29.95, available at La Roche-Posay. Dakar opts for application on clean, damp skin. "As soon as you wash your face or exit the shower, gently pat skin dry (don’t rub) and apply your skin-care regimen," she says. "You don’t have to use as much product, and more moisture is sealed in when you follow this process." For dry or aging skin, she says to cleanse with an oil-based cleanser, like her Buriti Purifier. "To nourish, I love oils!" exclaims Dakar. "They help regulate oil production. A lot of my clients feared oils, but once they [tried it], they swore by it." Look for an omega-3-rich flax seed oil like Organic Omega Booster to feed the skin, boost circulation, and reduce irritation and inflammation. "Acneic/oily skin will do best with a foaming face wash that will absorb oil, clean skin, and help decongest pores, [preferably one] with no sodium laurel sulfate or other detergents,” says Dakar. As for hydrating? For aging/dry skin, Dakar points out you need a treatment product to work hard all day to help diminish fine lines while increasing collagen production and firming skin. "For acne-prone skin, hydration is key — but steer clear of mineral oil or pore-clogging ingredients," she advises. "Look for something with silver or probiotics to help keep skin hydrated while controlling sebum and shine." SPF 30 is a must — says Dakar, "Why work hard to keep skin young with facials and good products and then just flush it down the toilet by not using sunscreen? It’s like working out and then drinking a milkshake right after." For acneic/oily skin, Dakar recommends lactobacullua acidophilus and bisibo bacterium. "This helps skin fight stresses like allergies and topical diseases," Dakar explains. 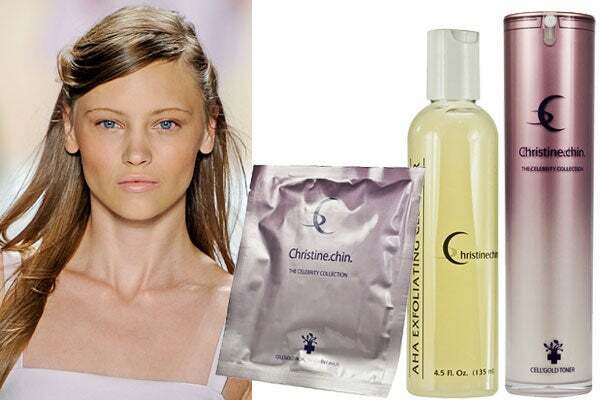 As for anti-aging, she opts for nano resveratro, summer snowflake, and buruti oil. For skin lightening, Dakar is a fan of beledes, a breakthrough ingredient derived from daisies. "When I launched my skin care brand in the '90s, I was among the first to focus on problem skin and corrective skin care," Dakar states. She also integrated natural ingredients. "Facials were considered foofy, and I am proud to say I changed that image." Sonya’s own skin-care routine consists of Buriti Oil Cleanser, Flash Facial & Nano Mask (every other day), Organic Omega Booster, Retinu, Stem Cell Transformer, Nano Hydrator, Eyeposuction, and SPF 30. "I use all of this on my face, neck, and chest daily," Dakar says. She also takes Perfect Woman Vitamins and Acidophilus Flora every day and stirs up an Ultima Power Shake when she gets to work. Sonya Dakar Beauty Bootcamp Ultima Power, $59, available at Sonya Dakar; Sonya Dakar NutraSphere Stem Cell Transformer, $185, available at Amazon; Sonya Dakar NutraSphere Buriti Purifying Facial Cleanser, $59, available at Sonya Dakar. Says King, a pea-sized dollop of foaming cleanser is all you need. "Apply to damp skin and rinse well, especially around the hairline, as blackheads will result if makeup gets stuck here," she explains. Use ring fingers to apply a rice grain’s worth of eye cream. "Don’t put right on the eyelid or product will seep in [your eye] via your eyelashes," King cautions. "You can guarantee puffy eyes in the morning by doing so." "Spritz toner should be your first layer of hydration, but can also be used over makeup throughout the day for instant refreshment," says King. "I can’t live without Dermalogica Precleanse, Overnight Repair Serum, Age Reversal Eye Complex, Antioxidant Hydramist, and Skin Perfect Primer SPF 30." For oily/acne prone skin, King says to look for kaolin, menthol, salicylic acid, tea tree oil, niacinimide, and cinnamon bark. Aging skin does best with palmitoyl pentapeptide, oligopeptides, all the vitamins like A & C, retinol, magnesium asorbyl phosphate, and hyaluronic acid. Dry skin? King opts for evening primrose oil, shea butter, vitamin E, rose hip seed oil, and argan oil. King says not to stick to the same thing your whole life. "Your skin needs change and it needs good products," she points out. “Get [evaluated] by a professional, learn about your skin type and condition, and what you should be doing each day and night." She both "prescribes" it and follows it herself. Here, the six steps to beautiful skin, per King. Double cleanse at night with an oil-based cleanser, followed by a cleanser for your skin type. Exfoliate daily, but gently. Spritz with a hydrating toner. Apply a treatment product to treat your skin concerns (pigmentation, aging, breakouts, etc.). Apply an eye product targeted to your eye concerns (puffiness, dryness, aging, etc.). Apply moisturizer with SPF. 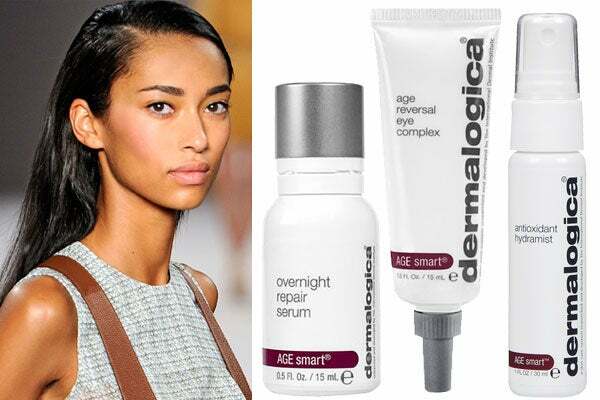 Dermalogica Overnight Repair Serum, $60, available at Dermalogica; Age Reversal Eye Complex, $75, available at DermStore; Antioxidant Hydramist, $38, available at Ulta. "For dry skin, I would recommend using the Cell Gold Cleanser, Cell Gold Toner, and the Cell Solid Gold, which is good for hydration. For oily skin, I would recommend the AHA Exfoliating Cleanser, Oil Balancing Astringent, and Cell Liquid Gold to control the oil glands." Chin also says you should use a peel, like Cell Gold Gommage Peeling, two times a week for a good exfoliation. For all skin types, Chin says to look for products that are non-comedogenic. "For dry skin, definitely avoid using anything that may cause your skin to dry out, such as alcohol," she says. Instead, look for products that have humectant, glycerin, and dimethicone, which prevents water loss. For oily skin, Chin says to avoid products that contains oils and look for products that have some alcohol or AHA to control those hyperactive oil glands. "Toner is an important part of a skin-care regime. Without it, it's like using toothpaste without a toothbrush," Chin says. She also swears by avoiding excessive sun exposure in order to prevent serious damage and health issues with your skin in the future. "Any skin-care regimen should include cleanser, toner, moisturizer, SPF, and eye cream," she says. "I personally add a serum on top of my moisturizer, one that has glycolic acids and retinols, which I recommend clients to do so as well." A few times a week, Chin says she also does a mask or exfoliation. Christine Chin Cell Gold Gommage Peeling, $120, available at Christine Chin; AHA Exfoliating Cleanser, $28, available at Christine Chin; Cell Gold Toner, $48, available at Christine Chin.